The forecasters, such as FiveThirtyEight, New York Times, Washington Post and Huffington Post, are predicting Cory Gardner the Senate winner, with higher and higher percentages: 538 – 78%, NYT – 84%, HuffPost – 62% and WashPost – 96%. The handicappers, that is, observers who examine more than just the late polling data and trends, but also consider the campaigns, history of the state, etc., still rate the state a toss-up as of Wednesday, October 28 (Cook, Rothenberg, Sabato). Udall counters this national narrative with private polls that claim he’s up a point or a bit more and a massive GOTV campaign to try to bring out people who, but for the effort, would not vote (and, hence, be missed by pollsters). November 4 will provide the judgment. Two Colorado ballot issues are headed to defeat because the negative advertisements have convinced voters they’re bad ideas. Another one is just a perennial loser. The agricultural community’s stomp on food labeling is especially impressive. Former Agricultural Commissioner Don Ament, the head of the Farm Bureau, and others have effectively persuaded Coloradans that labeling genetically modified food is a bad idea. It’s now losing 49 percent to 30 percent after leading nearly 2-to-1 in mid-September (52% yes to 27% no). The food industry spent about $15 million compared to less than $1 million by the proponents. Not surprising, gaming is losing, but now by 3-to-1. When will the out-of-state gaming interests realize that the public has a low tolerance of more gaming and the current gaming cartel has no intention of allowing it to happen? We don’t even like Rhode Island. Very big money in this issue is good for consultants and TV stations. Personhood expires again, but is getting about a third of the vote, which is more than usual. Even in a better year for the issue, it’s a loser. The open meetings proposal is winning. The Independence Institute finally wins one 3-to-1. The Secretary of State and State Treasurer races appear to have a little life in them, but Republicans are advantaged in low visibility down ballot races by the expected more conservative and more Republican midterm electorate. More than a fifth of voters are still undecided in the Secretary of State race and Democrat Joe Neguse is only five to seven points back of Republican Wayne Williams (31% to 36%) in one recent poll. Neguse is on TV with a positive advertisement. The State Treasurer contest appears to be the only close race. Betsy Markey is two points behind incumbent Republican Walker Stapleton, with 12 percent undecided in the only public poll from PPP published October 19. Markey has been on the offensive with negative ads concerning Stapleton’s attendance at work, always an attention-getting charge. Democrat Don Quick simply never gained any traction for Attorney General against Republican Cynthia Coffman. He’s been ten points or more behind in three polls published during the last month. 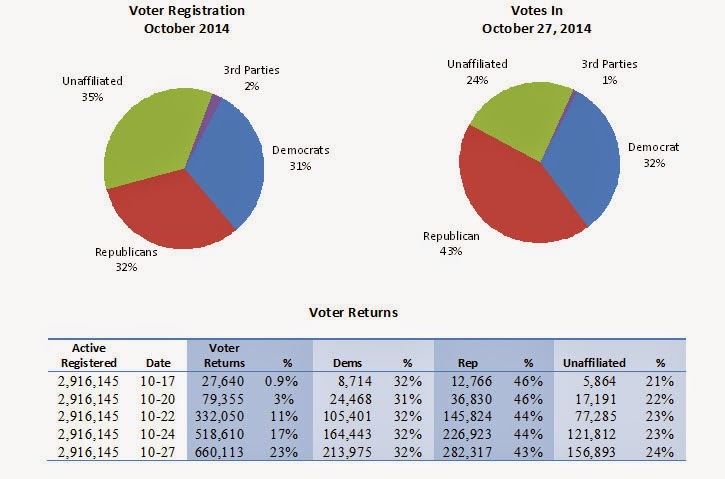 The second update on the 2014 turnout shows returns of 905,500 as of Wednesday, October 28. They are slightly less than half of the expected turnout of 2.2 million (41%). The estimate based on voter turnout in 2010 is about 2.2 million voters (72% of active voters of 2.9 million). They are 31 percent of the active registration of 2,916,145. The Denver Post story by Mike Klis on October 14, 2014 cited a new Harris poll that reports that the Denver Broncos are the most popular NFL team in the U.S. (not the Cowboys). Former NFL Commissioner Paul Tagliabue (head of Georgetown University alumni) said Pat Bowlen is one of the greatest owners in modern NFL history. A key player over the years in labor negotiations, TV rights, new stadiums and global reach. Hall of Fame – next time! Mark Udall’s team and allies are fighting back against the dominant narrative that polls and national forecasters are projecting – Udall loses. He has released three internal Democratic consultant polls in the last week claiming that he is ahead. Mark Mellman, one of the party’s best known pollsters who correctly predicted the Democrats would win North Dakota in 2012 in spite of most of the public poll predictions, claims Udall is three points ahead (44% to 41%). President Obama’s pollster, Joel Benenson, also claims Udall is up three (47% to 44%). Finally and most recently, a local pollster, Chris Keating, asserts Udall’s lead has declined to one point, but he’s still up. 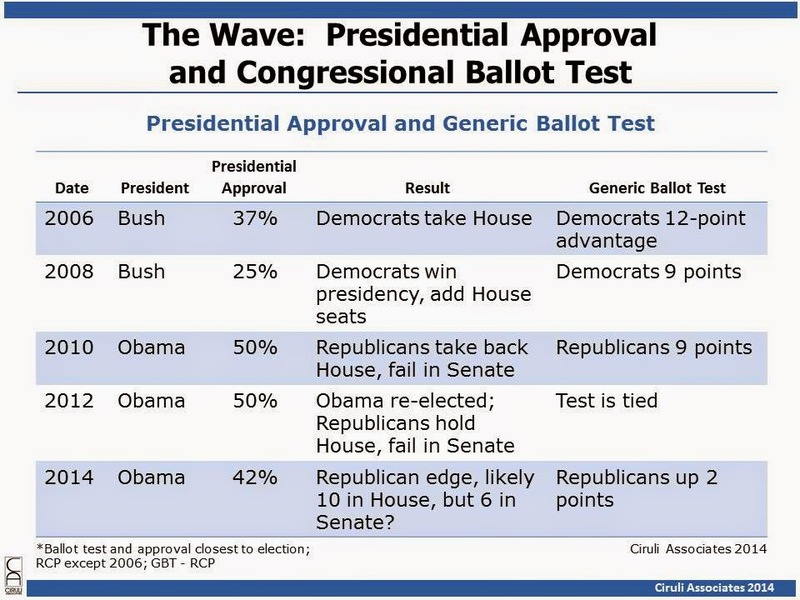 These polls were released the week of October 20 as Udall was contending with the “war on women” meme and poor national polls. They also argued public polls in Colorado have underestimated Democratic votes, especially Hispanic and cell phone voters (i.e., youth). FiveThirtyEight’s Harry Enten wrote a blog addressing most of the criticism, but, of course, one benefit of election polling is that on November 4 there will be a hard count. The campaign’s main alternative narrative is not arguing polling accuracy, but highlighting what it hopes will pull the race out – GOTV. After 2012, Washington pundits characterized Colorado as “leaning blue” following two convincing wins by Barack Obama and Democratic control of its U.S. Senate seats, the governorship and the state legislature. Indeed, as 2014 began, both incumbents — Sen. Mark Udall and Gov. John Hickenlooper — were expected to win re-election, possibly not by large margins given the challenges of a midterm election with an unpopular president, but win nonetheless. 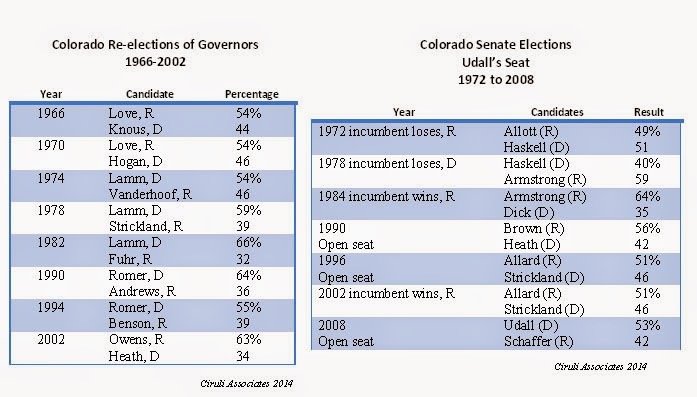 First, no incumbent Colorado governor or senator had been defeated since the 1970s. But also, during the last 10 years, the Democratic Party built one of the best state-level political machines in the country with interlocking funding, candidate recruitment and support, and an advanced get-out-the-vote operation. 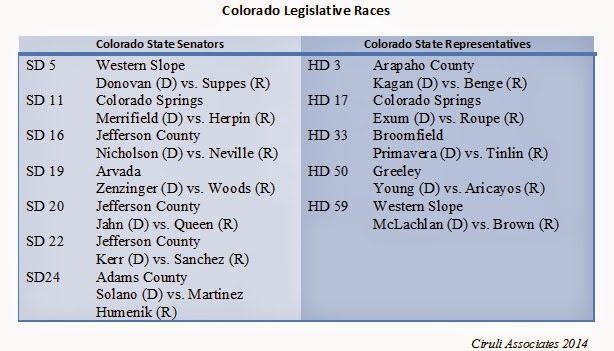 Despite these advantages, Colorado’s 2014 Senate and gubernatorial races are among the most competitive in the country. In fact, now Washington analysts believe control of the U.S. Senate may be decided with the fate of Mark Udall. Mark Matthews, The Denver Post’s D.C. reporter, adds up the money and finds Colorado spending on the U.S. Senate race alone is above $80 million as of the September 30 reports compiled by various media and good government non-profits (Center for Responsible Politics, Colorado Public Radio). Once again, the misnomer that Republicans are better funded is refuted. 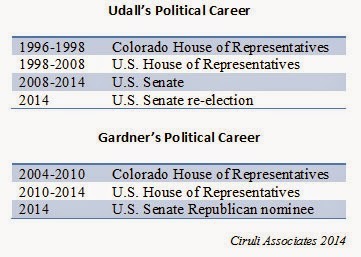 Udall raised nearly twice as much as Gardner. It is the independent money that is keeping Gardner competitive in the race, which explains why Democrats are so opposed to the Citizens United Supreme Court decision, which provides new sources of revenue for independent campaigns. It is very likely the race will raise and spend more than $100 million before November 4. 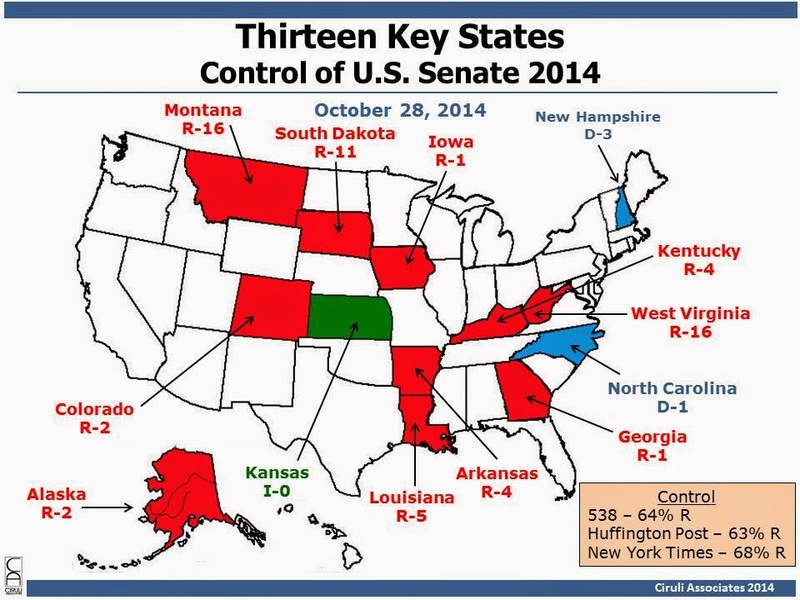 The major forecasters have the Republicans winning the six seats needed to take control of the U.S. Senate. Colorado is now placed in the Republican column – a shift from before Labor Day when Udall was ahead and earlier in September when it was a toss-up. However, all the observers agree that the latest polls are too close to rule out a Democratic win in Colorado and Republican falling short of six seats. The Colorado prediction is based on the track record of a race with Colorado’s characteristics; e.g., incumbent Democrat (forecasters look at different characteristics, some only use polling data), and Republicans having a two-point lead seven days out. Historically, in a contest like that, the Republican has an 80 percent likelihood of winning. At the moment, Democrats look to hold incumbents in New Hampshire and North Carolina, but not in Alaska, Arkansas, Colorado and Louisiana. 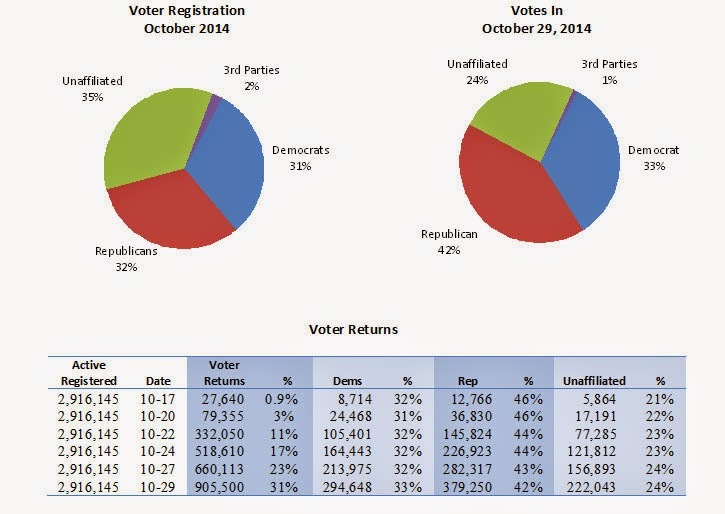 The Buzz will be publishing a regular update on the 2014 turnout. 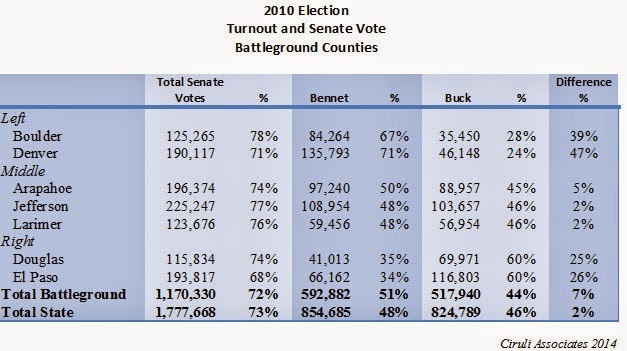 The estimate based on voter turnout in 2010 is about 2.2 million voters (72% of active voters of 2.9 million). The returns of 518,000 as of Friday, October 2014 are below what would be expected a week into the election (18%). Although each election is unique in its turnout pattern, given the attention on voting in the 2014 election and the universal mail-back ballot, it was assumed about a third of voters would return ballots the first week. Ballot mailing began Tuesday, the day after Columbus Day, October 14. The Hickenlooper vs. Beauprez race is still too close to call. Many of the most active Denver area political actors believe Governor Hickenlooper will hang on for a win, but their voices don’t have a lot of confidence. 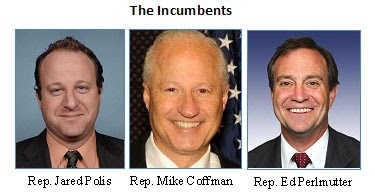 To some extent, their views are shaped by the weak campaign of Mark Udall, who they now believe is losing. The polls have bounced around, but Hickenlooper is ahead in a couple of the latest polls. Although Hickenlooper doesn’t inspire much enthusiasm from grassroot Democrats, he is the beneficiary of the extensive Democratic GOTV efforts being used to help Udall and the rest of the ticket. It may not be the long looked for wave benefitting the Republicans, but the water is getting very high for the Democrats. President Obama’s approval rating has declined 2 points the last two weeks, just as the generic ballot test for congressional preferences has risen 2 points for the Republicans. No doubt related metrics. If the Democrats lose the senate as expected and 10 or more seats in the House, this midterm would constitute Shellacking II sans the wave. Mark Udall is losing his bid to be re-elected and a major reason is his poorly constructed media campaign that has raised his unfavorability rating more than his opponent’s. Now down by more than the margin of error (MOE) in most of the recent Colorado polls, Udall, in a desperate last move, is releasing advertising showing him smiling and climbing mountains, his preferred activity. Too late. The latest poll to be released by USA Today/Suffolk University, their second of the season, shows him losing to Cory Gardner by 7 points (their Sept. 16 poll had Udall down by 1 point). Udall is now behind by 4 points on the Real Clear Politics arithmetic average and predicted to lose in Nate Silver’s 538 forecast by 80 percent. It is the USA Today/Suffolk poll that highlights Udall’s poor favorability rating as a major factor in his poor performance. Udall’s favorable to unfavorable rating is 41 percent to 54 percent, a 13 percent negative spread. Gardner has a 45 percent to 41 percent rating, or 4 points to the positive. The USA Today/Suffolk poll asked which candidate ran the most negative campaign and Udall won that 46 percent to 29 percent for Gardner. In an analysis by Harry Enten in the 538 blog, the difficulty of making up deficits in polling averages of 4 points with get-out-the-vote efforts is highlighted. Of course, part of Udall’s problem is that in the last week the President has lost 2 points in his approval average and Republicans have picked up 2 in the generic ballot test. It may not be a wave yet, but the water is very deep for Democrats. After spending millions to convince voters, especially women, that Republican Cory Gardner is an extremist on women’s issue, the latest round of polls show the Democrats’ “war on women” strategy has become the war to alienate men. 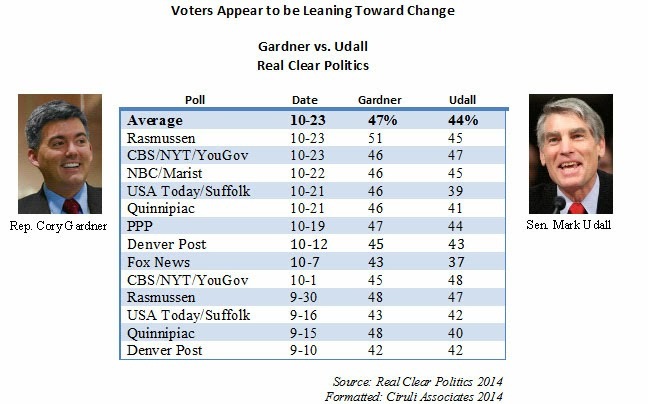 Mark Udall is losing in four polls shown below and one reason is that he’s losing more men than the de minimis advantage he is achieving from winning women. This is not news. We reported it in late August (The Gender Divide: Men Favor Gardner as Much as Women Favor Udall), but the campaign and its “independent” allies have ignored the data and run near saturation "war on women" advertising for more than two months. 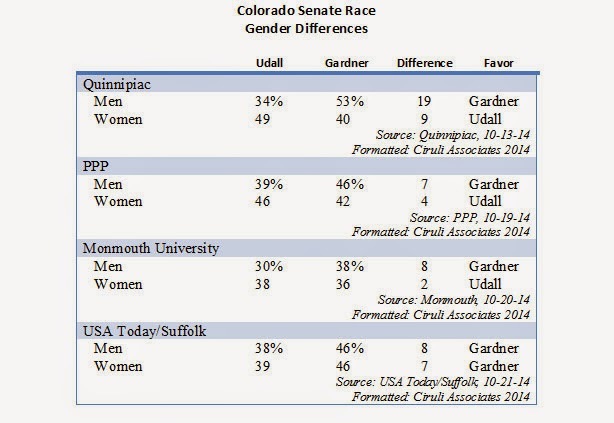 In the PPP poll, Udall has a 4-point advantage with women, but is losing men to Gardner by 7 points, similarly in each of the polls (the Udall vs. Gardner percentages: PPP – Udall 43%, Gardner 46%; Monmouth – Udall 46%, Gardner 47%; Quinnipiac – Udall 41%, Gardner 47%). 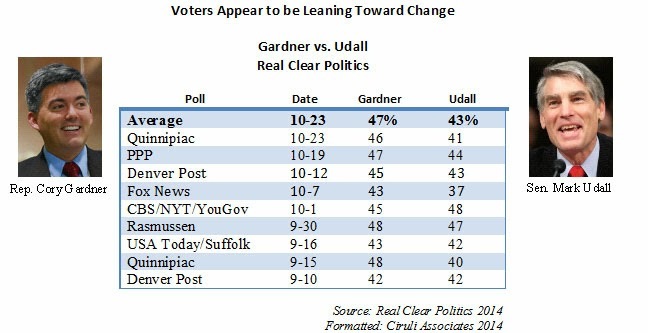 However, the capstone of Udall’s failure is highlighted in the latest USA Today/Suffolk poll, which Gardner wins 46 percent to 39 percent, but most important, the gender gap has disappeared. Gardner is winning with both men and women. This does not mean the gender gap has permanently disappeared. But, it does suggest as a template and blunt instrument for Democrats the “war on women” is over. Janet Hook in the Wall Street Journal captures this story's national reach: GOP gains in key senate races as gender gap narrows (Oct. 24, 2014). 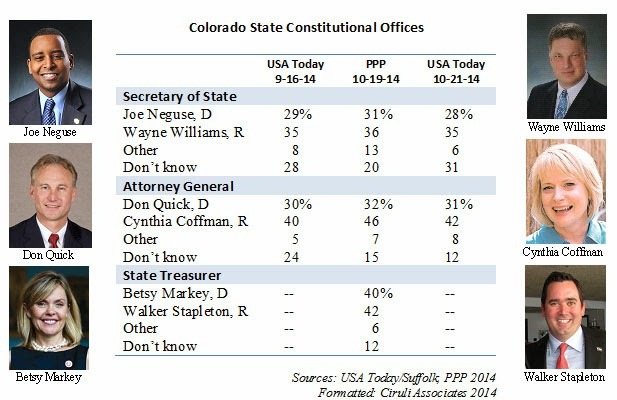 Cory Gardner leads the polls, but Mark Udall wants to lead the counts. Seven Front Range counties provide the clearest framework to observe the race Election Night. They are the best indicators of where the race will be fought. The data came from the 2010 Michal Bennet vs. Ken Buck race for U.S. Senate. Boulder and Denver provide the largest Democratic majorities among the state’s top 11 counties. Douglas and El Paso contribute the largest Republican majorities of the top counties. The swing counties that provide the closet results are Arapahoe, Jefferson and Larimer counties. 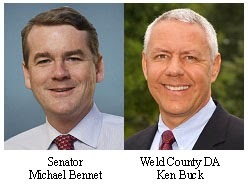 In 2010, Bennet carried the seven-county battleground area by 51 percent to 44 percent, and won statewide by two points. Hispanic Voters – How Many Vote by What Margin? Hispanic voters are becoming a key element in Colorado politics, representing more than 10 percent of the vote and likely to double that amount in a few years (they are 20% of the population). Most recent polls tend to give Democrats about a 20-point advantage with them. A 60-40 percent split would be about the Hispanic level of Democratic support in the 2010 midterm. But by a number of public opinion measures, Democrats appear to have been hurt by the recent delays in immigration decisions. A number of Hispanic political leaders and opinion writers are sending, at best, warnings to the party and, in some cases, encouragement for the community to not vote to punish Democrats. Gallup reports that among the overall population, only 15 percent of adults rate immigration important, but 25 percent of Hispanics do – their second biggest issue after the economy. A Wall Street Journal/NBC News poll had Hispanics approving the president by 56 percent above his 42 percent national average, but below the 62 percent approval Hispanics gave him in 2010. That gap is a measure of the decline in Hispanic enthusiasm for Democrats. And, although 62 percent said they prefer Democratic control of Congress, that is down from 90 percent in 2010. At the very moment embattled Colorado Democrats need their base to turn out and support them, national politics may be undermining the effort. Mark Udall is only in his first senate term, but because he started his senate career at 58 years old and is being challenged by 40-year-old congressman, he is seen as part of Washington’s poorly functioning congressional establishment. Stories often describe Cory Gardner as the young, energetic congressman. And indeed, Udall is an older member of the Baby Boomers and Gardner represents the increasingly dominant Generation X.
Udall’s senate career was delayed by four years due to Ken Salazar jumping into the 2004 primary for the open senate seat of retiring Ben Nighthorse Campbell, a party contest in which Udall had been the frontrunner. The percentage of voters registering independent (unaffiliated in Colorado) or stating their independent status to pollsters has surged in recent years. It is a reflection of America’s dissatisfaction with government and belief that both parties are to blame. Independents are now the largest bloc of voters in Colorado. From Barack Obama’s first election to today’s midterm, unaffiliated voter registration in Colorado has increased 40 percent. Today, 37 percent of registered voters are unaffiliated. However, they are an even larger bloc of inactive voters. They tend to vote less frequently. Normally, in polls of likely voters they are the smallest group in the sample, typically between a quarter and 30 percent. Because of Colorado’s population growth since 2008, overall voter registration has increased more than 411,000 voters. Marijuana, which had not been an issue in the governor’s race largely because both candidates did not support legalization, suddenly became part of the conflict during last Thursday’s Fort Collins Channel 9KUSA debate. From a question by Brandon Rittiman, KUSA’s political reporter, Republican candidate Bob Beauprez said he believes marijuana has a deleterious effect on young people and he would support repeal. Governor John Hickenlooper was more cautious and said repeal was not called for at this point. 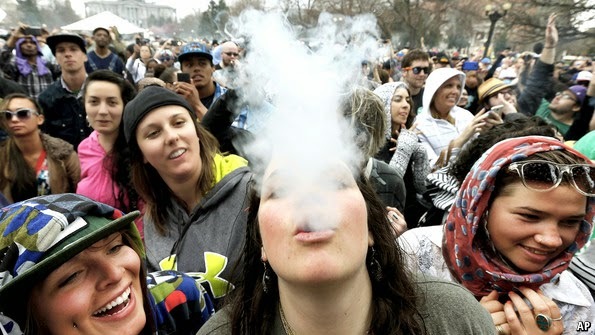 Recent polling appears to show some deterioration in pubic support for legalization. Only 50 percent of Colorado voters support it and less than half (42%) approve the state’s effort at regulation. Democrats, including Hickenlooper and Senator Mark Udall, have been recipients of marijuana industry campaign contributions and Congressman Jared Polis is a high-profile advocate of federal legalization. It is not clear the issue will move any voters. Coloradans are closely divided on the legalization and commercialism of marijuana. But, a repeal has not had a public discussion. Does Beauprez win votes as the most anti-marijuana candidate, does he lose libertarian Republicans, does he attract late money to oppose him from the pot industry or is the issue of low interest and little affect? 9News: Should Colorado repeal legal marijuana? The Economist: High, Tolerant and Republican? The top reporters for the Economist don’t receive bylines, but Lauren Schuker Blum replaced Tom Nuttall, who is now writing the regular European commentary (Charlemagne) from Brussels. She asks and attempts to answer the question that frames the 2014 Colorado election: How does a state that has behaved so liberally the last half decade appear to be treating its top Democrats so poorly in their re-election? President Obama’s unpopularity after just winning the state substantially in 2012 is the top reason, along with Republican challenger Cory Gardner’s “Mona Lisa smile” and well-run campaign. Incumbent Mark Udall, following the Democratic Party’s 2014 playback, has attempted to show his independence from Obama, but Republicans have been relentlessly arguing that Udall sides with the President “99 percent” of the time. The Democratic attack that has become tiresome is that Gardner is an extremist due to his pro-life position. The “war on women” ads are so repetitive and harsh that they not only seem to have lost affect, but are producing a backlash of criticism. However, Udall’s biggest vulnerability may be – after a 16-year career in office (Colorado State House starting in 1996, four terms in the U.S. House) – it’s hard to identify his signature issue. Critics say Mr. Udall’s negative campaign reflects his lack of accomplishments. He comes from an old political family: his father ran for president in 1976, and his cousin is a US senator from New Mexico. But “the problem is that Udall just hasn’t done a whole lot,” says Mr. Ciruli, the pollster. This is not fair. He is the best golfer in Congress. He is also a reliable eco-warrior, voted against the Patriot Act because of his belief in privacy and battled with the NSA over its spying on Americans. On the campaign trail he stresses his love of civil liberties and independence from Mr. Obama. Real Clear Politics has proposed a new index to measure strength of the two parties nationally by aggregating election results and creating an index showing the partisan control of the presidency, Congress and the states; i.e., governors and legislators. A slightly modified version in Colorado shows the parties in close competition and, although Democrats are exercising more control due to their holding the governorship, both senators and a majority in the legislature, Republicans have an advantage in raw numbers due to their majority of county commissioners. In recent elections, John Hickenlooper received 51 percent of the 2010 vote for governor and Michael Bennet received 48 percent of the vote for U.S. Senate. The 2012 total congressional vote was 1,076,000 for the Democrats and 1,143,000 for the Republicans. And, of course, President Obama won the state twice, with 54 percent and 52 percent in 2008 and 2012, respectively. Republicans have considerable clout at the county level. They dominate county commissionerships nearly two-to-one and have near complete control of many top counties with Arapahoe, Douglas, El Paso, Jefferson, Larimer, Mesa and Weld. Democrats control Adams, Boulder and Pueblo. Denver is a municipal/county hybrid of “non-partisans” in which Democrats rule. Democrats tend to have somewhat more influence in large municipalities, but the officials are described as non-partisan. Bottom line is that Democrats, due to a strong campaign application and Obama’s popularity have dominated top positions since 2006 in Colorado, but that Republicans maintain a strong platform to keep Colorado competitive in 2014 and in the next presidential election. The Udall for Senate campaign intends on overcoming a bad Democratic year and any weaknesses in controlling the narrative with the vaunted Democratic turnout machine on steroids. This accelerated effort began in 2013 when Democrats in control of the legislature enacted universal mail-back voting. All 2.9 million active registered voters (and you can register even on Election Day) will receive a mail-back ballot replacing the old system of ballots only mailed to voters requesting them in partisan elections. Hence, the expected 2.1 million votes by November 4 could be substantially larger. To achieve this improved system, aspects of the Michael Bennet campaign 2010 machine (which helped pull out a 30,000-vote victory in a horrendous Democratic year) were merged with the 2012 Obama campaign’s use of big data, massive in-depth polling and sophisticated algorithms. And then the Udall campaign added more of everything. Voila, the new super turnout machine. Can relentless turnout efforts make up for “Democrats in trouble” narrative that is now dominant? Ballots are being mailed. Voting will start today. The Colorado Secretary of State reports all active voters will be sent a ballot. At least 2.1 million voters will send back their ballots, but with the convenience of mail-back ballots and active campaign solicitations, expect a major increase above 2 million. Which party benefits the most? 9KUSA’s Cheryl Preheim reports that the modest numbers of women in political office is changing. 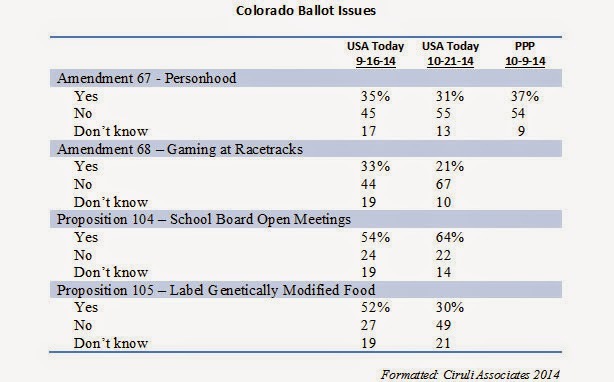 Colorado’s in the forefront and younger voters the driving force. Ciruli expects the number of women in the highest political offices to go up because local numbers are growing. “It is your county commissioners and mayors and city council people who become your legislators,” Ciruli said. In Colorado, women hold 30 percent of those local municipal offices. While women don’t hold any of the highest state offices, like governor or attorney general, the Colorado State Legislature has the highest percentage of women of any state with 41 percent. Ciruli says the day when the country is closer to a 50/50 representation at all levels of government is getting closer. He says the millennial generation will play a part in that shift. Polls confirm that Hillary Clinton commands the Democratic Party nomination and no one in the Republican field has more than a narrow slice of the Republican electorate. The latest McClatchy national poll had Jeb Bush as the Republican frontrunner with 15 percent followed by Rand Paul and Paul Ryan at 13 percent. Mitt Romney, who is now campaigning for Republicans in the midterm elections, repeatedly and vigorously states he’s not running for president, but he polls two times the current Republican field. Romney wins 34 percent of Republicans when he is included in the 2016 GOP primary (Washington Post/ABC News poll). Jeb Bush and Mike Huckabee come in second at 15 percent. He also wins 24 percent of New Hampshire Republicans (Suffolk University/Boston Herald poll, 6-20-14) and 35 percent of likely Iowa GOP caucus voters when asked who they would vote for the 2016. What about a woman on the Republican ticket? Condoleezza Rice is ensconced as a professor at Stanford, but she is speaking nationally on foreign policy and she is a CBS News consultant. When added to a recent Economist/YouGov poll, she tied the top of the field, sharing 13 percent of Republican Party favor with Rand Paul. And, Rice was among the top candidates on Mitt Romney’s vice president list in 2012. Romney-Rice would be a strong counter to Clinton and a likely Hispanic male vice president nominee for the Democrats. Denver Post Endorsement: Game Changer? If Colorado flips, Harry Reid is out. And the odds of that happening just jumped with the very strong Denver Post endorsement of Cory Gardner. Gardner has been a reservoir of ideas and leadership from the start of his career. Flipping the Senate to Republican control will, in their view, be more productive for the next two years. President Obama’s desire for a legacy and Republican self-interest in repairing their reputation for gridlock could converge and would be enhanced in the Post’s view by Gardner’s election (See The Buzz, October 13). The overall theme is that the best anecdote to gridlock is change. The criticism of President Obama’s handling of foreign policy in the Middle East has been sharp and sustained and it’s mostly from friends who served the President when critical decisions were being made (or not made). President Obama’s primary goal was to undo the “Bush mistakes,” which translated to getting out of Iraq and Afghanistan. There was never a strategy related to what’s next in the Middle East; hence, the vacuum that has been largely filled by bad actors and tragic events. The White House controlled foreign policy decision-making with a group of political operatives using domestic political criteria largely related to the November 2012 re-election. 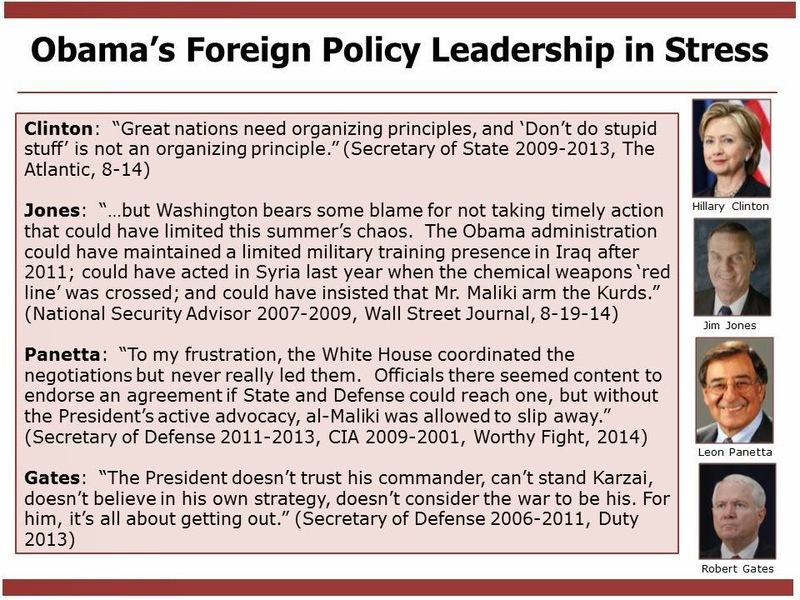 President Obama and his team were often not engaged and mostly inclined to cite the risks, not the objectives. Will Gridlock be Affected by Midterm Results? The likely midterm election results for the U.S. Senate are either a diminished Democratic majority (six seats currently) or Republican control. Will the change have an effect on the legislative – executive gridlock that has characterized Washington during most of President Obama’s tenure? Harry Reid’s leadership for another two years doesn’t produce much hope of an end to gridlock. A lesser majority could cause some weakness in his control, but the House will likely be even more Republican and not interested in helping the weaker Democratic majority. Would Republican control change the dynamics? Does Mitch McConnell come to believe some accomplishments and relief of gridlock will help his party in the more difficult 2016 environment (more Republican incumbents up in more competitive seats)? Would President Obama, looking for a legacy and less restrained by the Reid and Nancy Pelosi leadership team, be inclined to compromise on tax and entitlement reform, some piecemeal advance on immigration reform and some improvements to Obamacare? He, of course, maintains the veto to stop changes he believes go too far. That is, does Obama’s instinct for diplomacy and compromise and desire for a legacy align with McConnell’s desire to reposition the national Republic brand for governing and not just obstructing? The cultural community and friends of the Scientific and Cultural Facilities District (SCFD) are saddened by the loss of two good friends and champions. countless hours to the success and continuation of the unique and nationally recognized SCFD. Henry Lowenstein, a leader of the Denver theater community for half a century, was one of the earliest advocates for dedicated funding for the region’s cultural facilities and programs, which was realized in the SCFD. National Journal Asks: Why is John Hickenlooper’s Political Life in Peril? Nora Caplan-Bricker wrote a long piece in the October 4, 2014 edition of National Journal trying to explain John Hickenlooper’s political style and why his re-election is in trouble. She comes to several conclusions, including the challenge of being an independent-type of politician in a polarized era. It is a disposition that leaves a politician open to criticism for indecisiveness and a cadre of friends, but no passionate base. IN 2012, THE WORST thing that could happen to the Democratic governor of Colorado came to pass: Democrats, with turnout boosted by the Obama reelection machine, took control of both chambers of the Legislature. “The little pundit class out here,” says Colorado pollster Floyd Ciruli, “that November, we all said the same thing: big problem.” As Democratic lawmakers began to blaze through a wish list they’d been accumulating for years in the divided Capitol—not only gun control but also civil unions, marijuana, and strict renewable-energy standards—Hickenlooper's delicate balancing act became more difficult. On issues far more divisive than the budget, it was no longer possible to please all the customers. The second set of polls published in the last month still has Republican candidates ahead for Attorney General and Secretary of State. 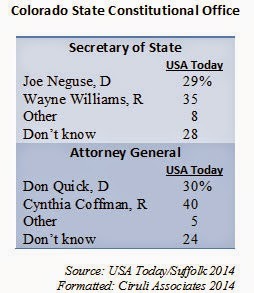 The latest poll was the USA Today/Suffolk University done on September 16, 2014, which gives Cynthia Coffman a 10-point lead over Democrat Don Quick and Wayne Williams six points ahead of Democrat Joe Neguse. 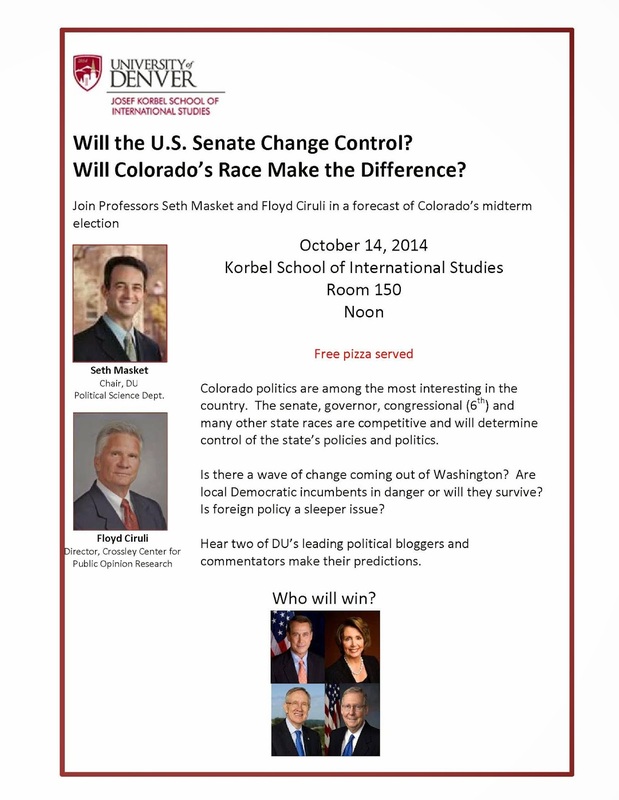 Charlie Cook believes the Colorado senate race may be one of three that decides control of the U.S. Senate. And, he rates it a toss-up. Colorado joins Alaska and Iowa as three too-close-to-call states and Republicans need at least one to get to six seats necessary for control. Colorado U.S. Senate candidates go hard at each other in Denver Post debate, John Frank and Joey Bunch, October 7, 2014. The tone also echoes the roughly $40 million the two campaigns have spent in TV ads, most of them dominated by attacks and shaded truths. Polls show the race remains unsettled. 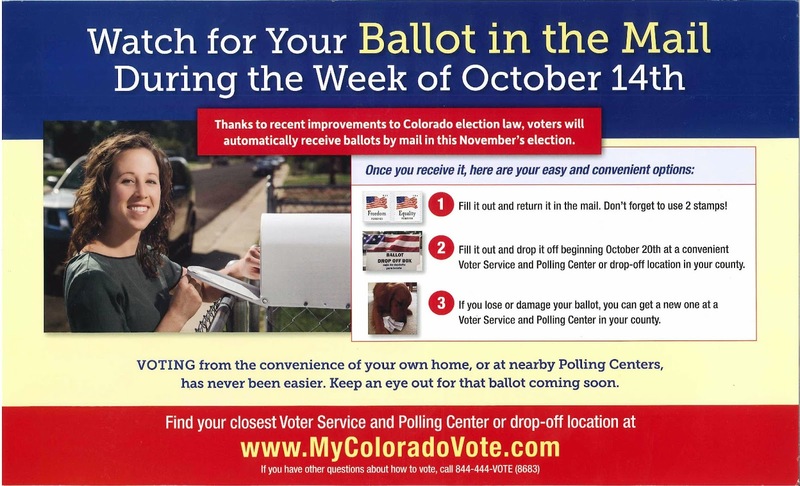 In seven days mail-back voting will begin, and in ten days upwards of 600,000 Coloradans could be done with the election, except for hearing the results November 4. The new voting system, enacted by Democrats in the 2013 legislature, could raise voter turnout well beyond the two million votes expected. As of October 1, 2013, there are 3.6 million Colorado voters. The entire 3.6 million registered voter base will receive a ballot on or about October 15. In 2010, 1.8 million voted and 2.5 million were active voters. Currently, 2.9 million are active. If 72 percent of the current 2.9 million active voters vote, it will be 2.1 million. Of course, since all 3.6 million registered voters are getting a ballot and it is the goal of the campaigns to reach additional voters, totals are likely to exceed 2.1 million. The Gary Hart scandal of May 1987 that ended his presidential chances is getting a fresh airing in a new book and New York Times article by Matt Bai and a criticism of it by the former editor of the who broke the story, Tom Fielder, in a Politico article. Both are good reads, especially notice the end of Bai’s New York Times piece and Hart’s continued unhappiness with the missed opportunity. Barack Obama was hoping the last time in his eight-year term the War on Terror would ever be an issue was when it benefitted him in 2008. He was the president to end America’s wars. But since September 2001, the War on Terror and our foreign fights have been frequent topics and, in some cases, dominated midterm elections. In the 2002 midterm, foreign policy helped President G.W. Bush and in 2006 hurting him. Today, the first campaign advertisements are beginning to appear attacking Democratic senate candidates for their association with President Obama’s slow reaction to ISIS and the terror state. The first women arrived in Congress from Montana in 1917. Women received the right to vote as an amendment in 1920, the same year America outlawed liquor (repealed in 1933). Today, there are 99 women, about a fifth of the entire Congress of 535 (100 in Senate and 435 in House). It represents a third of all the women who have ever served (298). Today, Democrats tend to elect more, with 16 out of 20 women senators and 60 of the 79 House members. There is considerable leadership among the women’s delegation, with Nancy Pelosi, the Democratic leader in the House. Diana DeGette is in second position in terms of seniority as a Democratic Chief Deputy Whip. The Senate has numerous women in leadership positions, such as Dianne Feinstein, head of the Intelligence Committee; Barbara Boxer, Environment; and Patty Murray, Budget. Also, a large number of women are in key senate battleground races. Senators Jeanne Shaheen (NH), Mary Landrieu (VA) and Kay Hagan (NC) are Democrats fighting for re-election. Women challengers include Republican Joni Ernst in Iowa and Democrat Alison Grimes of Kentucky who is trying to defeat Republican Minority Leader Mitch McConnell. In 2014 in Colorado, a woman was selected as the Republican Lieutenant Governor nominee (Jill Repella), Cynthia Coffman is the Republican Attorney General nominee and Democrat Betsy Markey is running for State Treasurer. About a third of local municipal officials (mayors and councilpersons) are women. About a quarter of all state legislators nationwide are women. Colorado’s 41 out of 100 is the highest percentage among all 50 states. 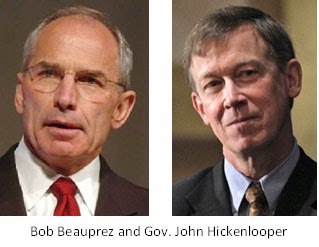 The general rule is Colorado incumbent governors and senators win re-election. But, the rule has been suspended in moments of great turmoil. 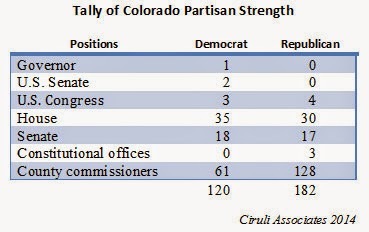 The 1970s was the last period of difficult times for Colorado incumbents. Two incumbent senators were defeated in 1972 and 1978 and one incumbent governor (1974). 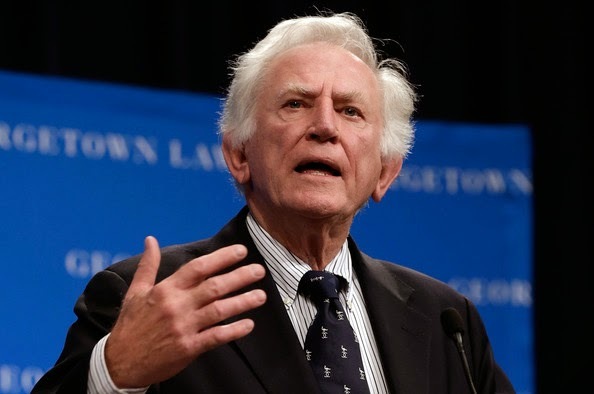 The Vietnam War, Watergate, the rise of environmentalism and the coming of political age of the Baby Boomers destabilized the political environment and produced exceptionally high levels of dislike of the establishment and churn in the political marketplace. The weak Great Recession recovery, the endless War on Terror and rise of the Millennial Generation is fueling the current turmoil and Colorado’s Governor Hickenlooper and Senator Udall could be the victims. Will the Colorado State Legislature Change? Democrats control the state legislature with a one seat advantage in the Senate and five in the House. The Senate is where the main battle is with seven seats getting the most attention and four of them in the state’s leading battleground county – Jefferson. Only five House seats appear in play, meaning Republicans could reduce the Democratic majority, but are unlikely to change the leadership. Very few legislative handicappers see the Senate going Republican due to the Democrats’ continued dominance in money and campaigns, but most admit a pro-Republican tide could change the local dynamics and give Republicans Senate control. See 9News: Who will control the Colorado legislature? Colorado Democrats are beginning to fear the conclusion of their eight-year dominance of Colorado politics may be within sight. The high point was two years ago when Democrats controlled both senate seats, the governorship and the legislature. 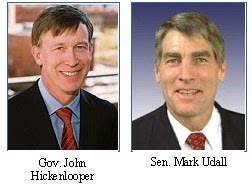 Senator Mark Udall now appears to be falling behind in public polls to Congressman Cory Gardner. His handlers have moved from arguing about the polls to claiming their hyper-GOTV effort will save the day. Maybe, but GOTV can’t turn out people in a weak persuasion environment. But, the bigger problem is the collapse of Governor Hickenlooper’s re-election campaign. Even in August before the polls turned south on the Democrats, Hickenlooper was running behind Udall by two or more points. A failing incumbent governor could drag down the entire ticket. Fundamentally, John Hickenlooper lost his highly valuable image as a centrist and non-politician with the 2013 Democratic legislature, the strange interaction with the Colorado Sheriffs, and the sudden and ill-presented death penalty decision. Colorado has become the latest battleground over the control of high school history curriculum. The Jefferson County School Board wants to review the curriculum for balance. Teachers and students believe they want to censor and candy coat American history. This battle is being fought within a larger struggle between the board and the union for power and money. 9News Political Analyst Floyd Ciruli says this is a debate that has spanned the nation. The Texas State Board of Education has taken up the issue and the Republican National Committee has issued statements showing concern over this curriculum. “This is all part of an even bigger struggle,” Ciruli said. He says conservative groups are worried about the type of students that are graduating from high school, politically. “All the polls indicate that this generation is much more liberal than previous generations and they're convinced that at least part of it is because of what they've been taught,” Ciruli said. Ciruli believes that AP U.S. history curriculum is being targeted for specific reasons. The billionaires, like Mr. Thomas Steyer, who want to promote a cleaner environment, are more than willing to forgo their causes and spend millions promoting other unrelated issues if they think it will get their candidate elected. Steyer is pending millions for Mark Udall, producing and placing ads on reproductive rights. Hot-button issues bring people to the polls. These topics get undecided voters fired-up in a way that energy issues don’t, according to Ciruli’s research. “The money would turn off here in a minute if it looked like either the Democrats or Republicans were consistently ahead, you would see the money disappear,” Ciruli said.